The Eastern Red-spotted Newt. A.K.A. Eastern Newt. Notophthalmus viridescens. This is the aquatic adult stage. When they’re younger, they have a terrestrial stage. On land, the “red efts” are startlingly orange-red colored, walking “don’t eat me!” signs (being toxic to most predators). 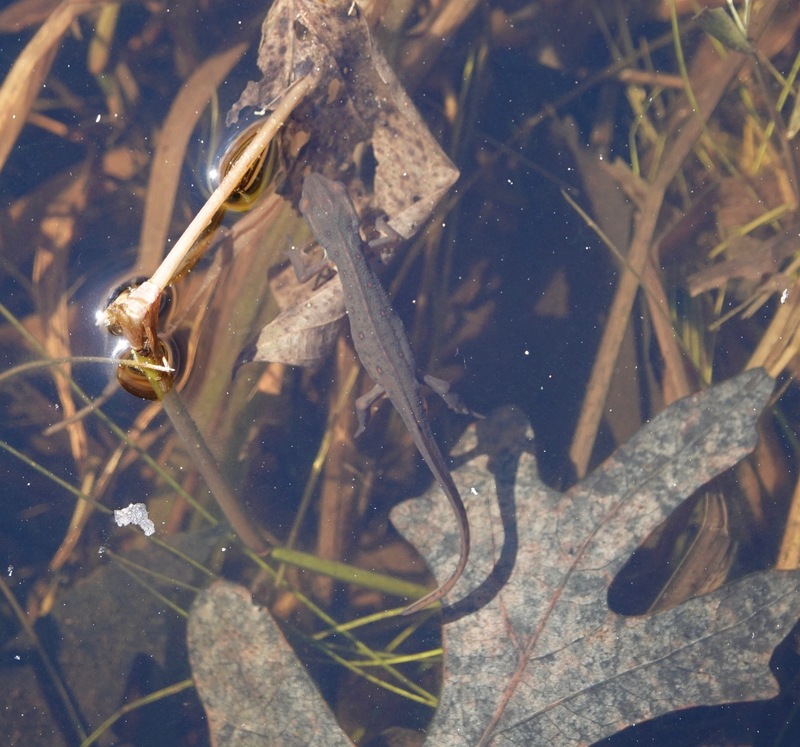 These spotted newts can live more than a dozen years. This seems to be a female, and gravid as all get out. She curled around this vegetation. 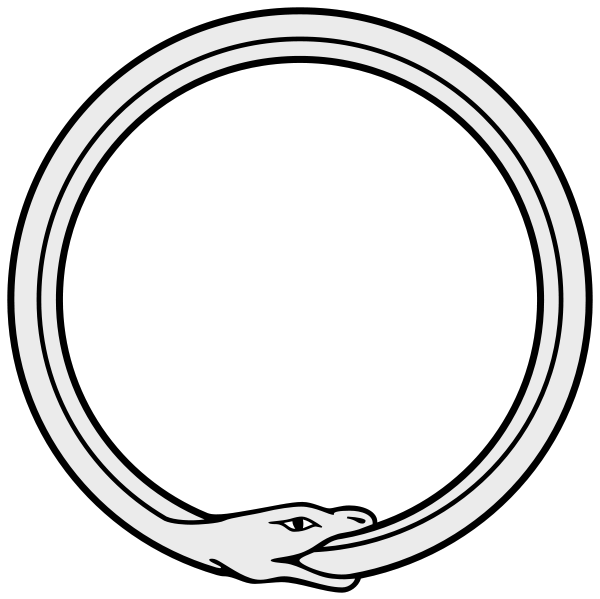 Ouroboros! It looked like she almost got stuck. Was she laying an egg? She’ll do one egg at a time, over a couple of weeks, wrapping each egg in a leaf or something similar. 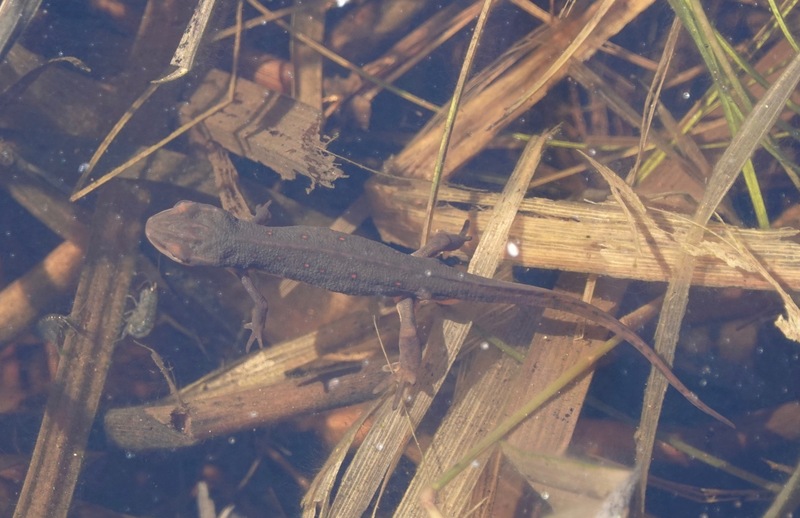 On the newt/salamander semantic issue: “Alone among salamanders found at the station, the eastern red-spotted newt is a member of Salamandridae, the family that comprises all “true salamanders” and newts. 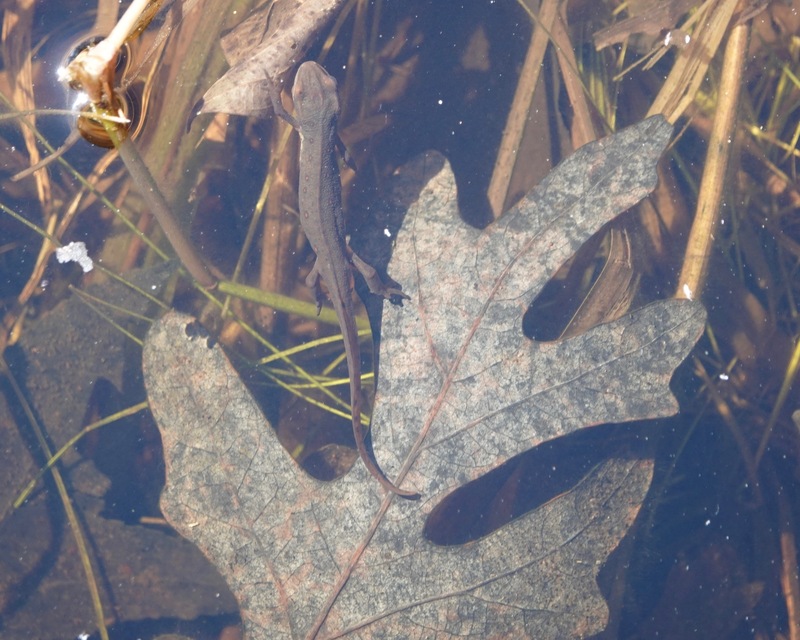 It is one of only 7 species of newt in North America, out of only 87 species worldwide. 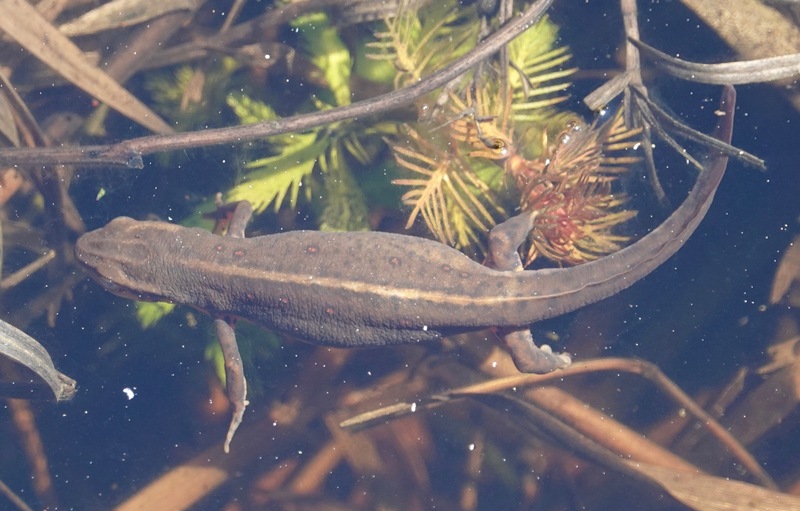 However, this prolific newt is second to only one other US salamander in the extent of its distribution — they are found throughout the eastern US, as far west as Texas and Minnesota. 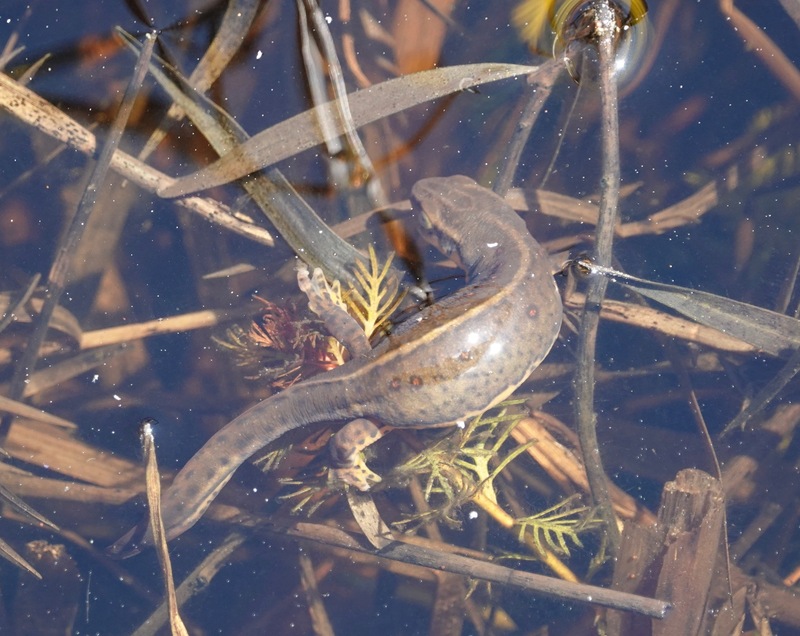 Although no one feature distinguishes newts from other salamanders, they tend to spend more time in the water as adults and have a more complex courtship system.” More about these critters. This one was the smallest of four seen here in New Jersey. 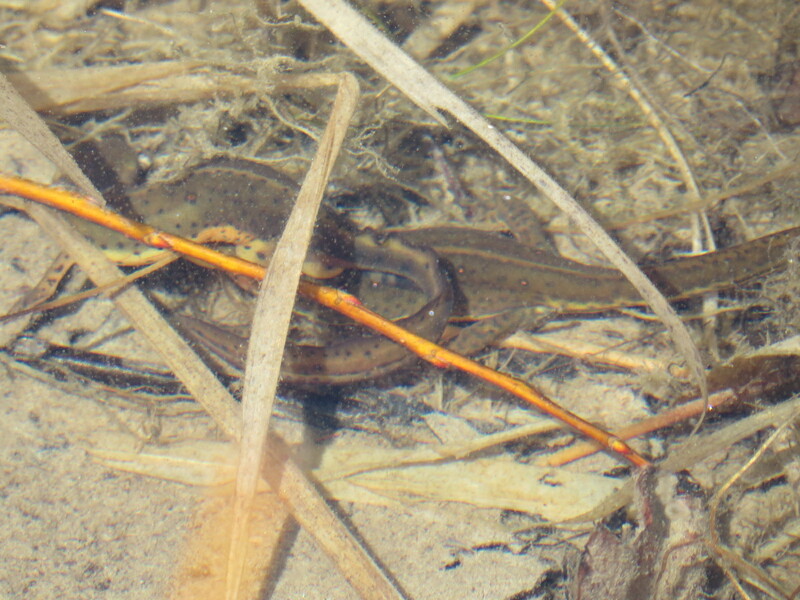 One of several Eastern Newts (Notophthalmus viridescens) in the high reservoir at Black Rock Forest recently. The red-spots are telling here, identifying the animal (another common name is Red-spotted Newt) and warning predators to lay off. This is the mature, aquatic stage of the animal’s life-cycle. They can live more than a dozen years. As juveniles, a.k.a. Red Efts, they are bright orange and live on land. Wet, soggy land. The vertically flattened tail is fin-like. It’s hard to shoot life underwater without the proper filter, even in shallow water. 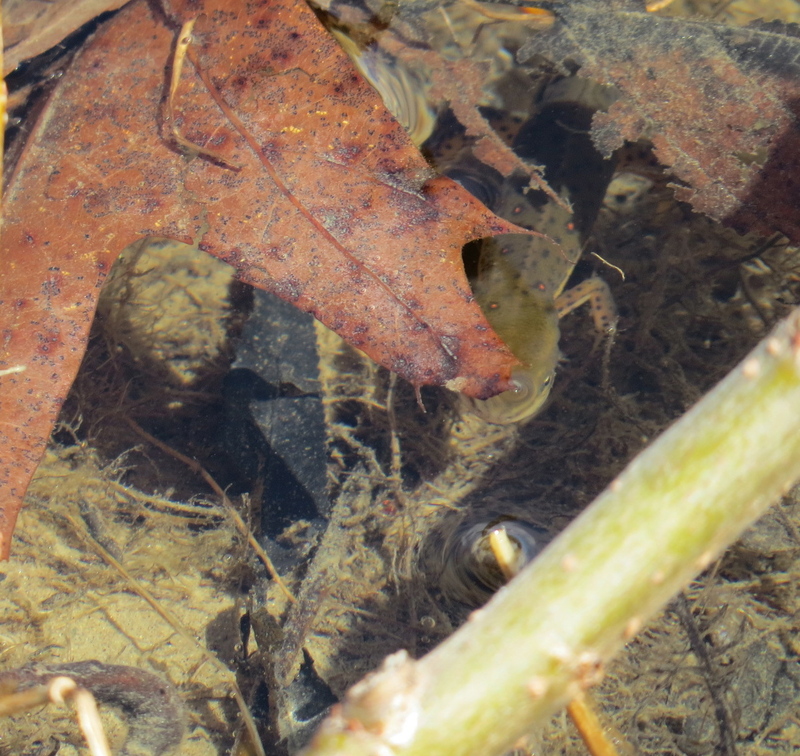 But I did manage to catch these two: This is a pair in amplexus, a term of amphibian art. 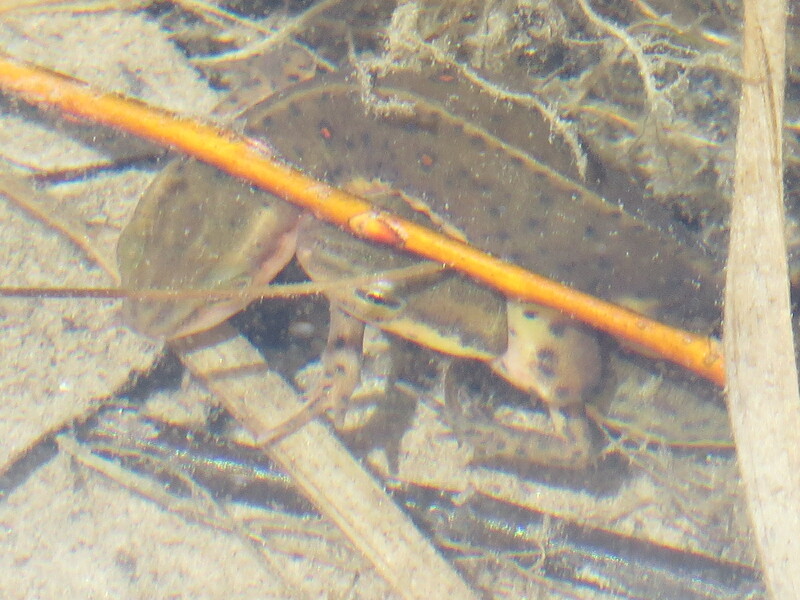 Amplexus is from the Lain for “embrace.” They fertilize externally, but this grasping and caressing by the male is something akin to human foreplay. I had no idea some people keep these as pets. I don’t think wild animals should be taken from their environment for such uses. One pet guide recommends not handling them much because the salts and oils on human skin can be bad for them. Indeed. How about just leaving them alone? As part of New York City Wildflower Week, I went up to Van Cortlandt Park in the nether reaches of the Bronx to join Ellen Pehek in turning over some old wood. Ellen is the NYC Parks & Rec Principal Research Ecologist and involved in a study monitoring Eastern Red-backed salamanders (Plethodon cinereus). 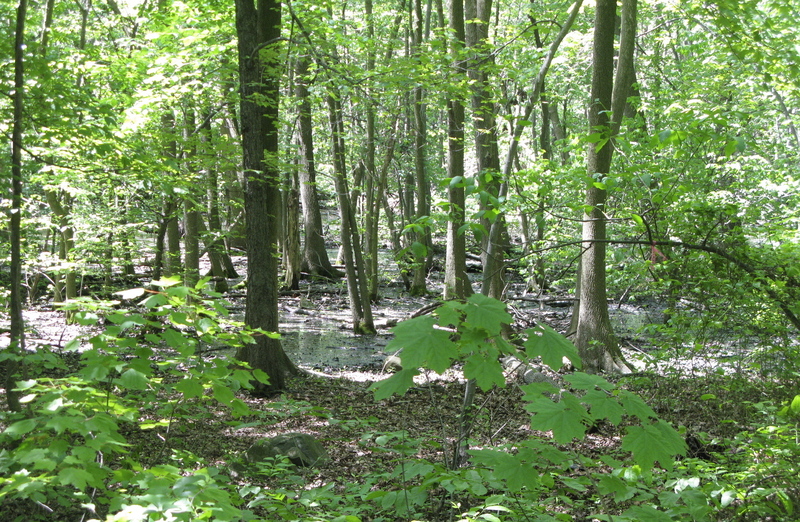 How do they respond to stressed, invasive-filled woodlands, as compared to relatively healthy forests? Wooden boards, one on top of the other with a little spacer in-between (I called them wood sandwichs) have been set up. The boards are now quite hard to find with the understory layer thickly covering the forest floor (the study checks them in the fall, when it’s easier). So we also turned over some downed tree branches. Red-backed like these cool, damp places, in fact must have them, since they breath through their skin (having no lungs). Of course, the dark and dank also attracts other creatures. 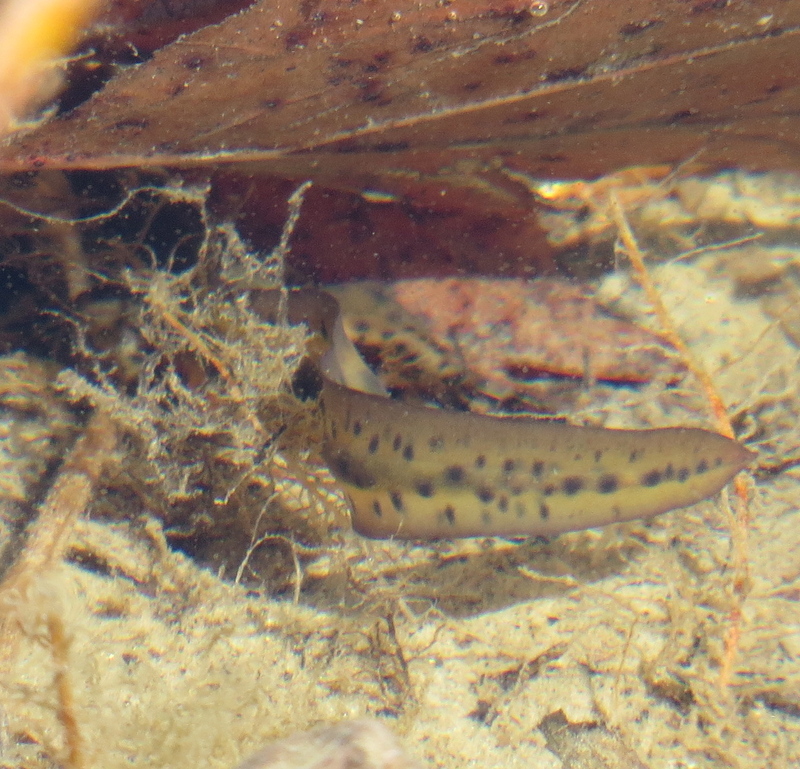 We found three individual salamanders: one little juvenile; one the so-called “leadback” type, the same species but without the reddish stripe; and one with the stripe, although this one was was more dull orangish than red. The leadbacks seem to predominate in hotter, dryer habitats. 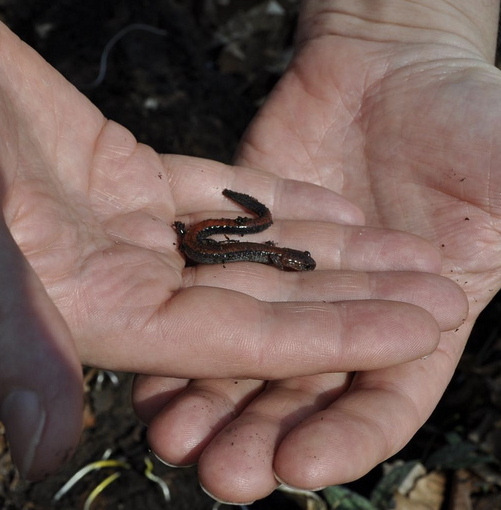 NYC salamanders have also been the subject of another study that found urban woodland specimens tougher than their country cousins when it comes to battling a pathogenic fungus that’s taking a high toll of amphibians around the world. Every twenty years or so, my dander gets up and I write a letter to the New York Times. In the mid-1980s, I did it to spank Edward Teller, who poo-pooed the concept of nuclear winter in an Op-Ed, with a reminder of the global climate effects of “Eighteen Hundred and Froze to Death.” That was the year (1816) without a summer, following the ejection into the atmosphere of human-historically unprecedented amounts of volcanic crap from Tambora in Indonesia. Although best known among the literate as that gloomy Swiss summer the Shelleys, Byron, and Polidori stayed indoors and made up some ghost stories, they were the lucky ones. The poor of Europe, following the long disaster of the Napoleonic wars, were walloped; it’s been called the last great subsistence crisis in that part of the world. The U.S. (we only had one coast then) was hard hit, too, forcing many people out of New England and westwards into New York and beyond, including the family of Joseph Smith. (Did a volcano gave birth to Mormonism? The Second Great Awakening started earlier, but the traumatic memory of starvation and forced migration may have fired further the kindling of the Burnt Over District. Discuss amongst yourselves.) A student of Nantucket history, I quoted in my letter the Argument Settlers, a collection of historic newspaper items from August 1816: “Ice made in pails.” In the middle of summer, it was so cold water froze overnight. So bite me, Dr. Strangelove. In the mid 2000s, I wrote to the Times again to protest the dispossession of a red-tailed hawk, popularly known as “Pale Male,” by the plutocrats of 5th Avenue — although, since I wanted it published, I didn’t use the word “plutocrat.” (Since then, I’ve decided I’m totally against naming wild animals, a grossly Adamic practice, imperialistically anthropocentric, the cute side of the pernicious exploitation of the natural world, but I know I’m fringy on this; the mob is deeply desirous of turning celebrity or marquee animals into pets.) But, my point, and, patience, Little Grasshopper, I am digressing towards it, is that today is the first time my hands have ever been in the Times. Last week I tagged along with Marielle and Hugh on their weekly trip to Staten Island for Marielle’s Spring Time series, being published every Thursday until the start of summer. I wanted to see some amphibians. I turned over a piece of wood to see what we could see. 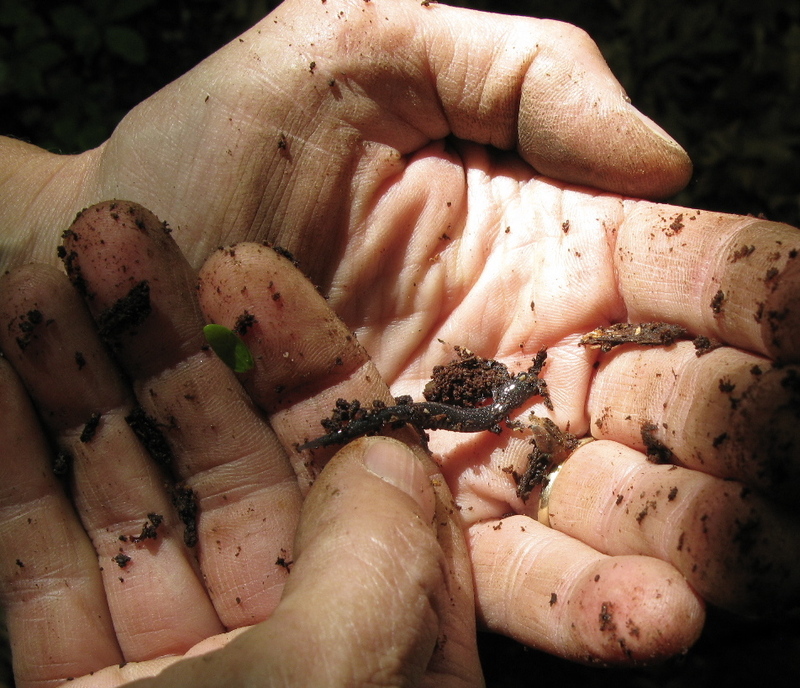 Behold, some pale orange ants, scurrying millipeds, and a Red-backed salamander, Plethodon cinereus. Now, the Americas have more species of salamanders than the rest of the world combined, although the animals seem to have originated in Eurasia. 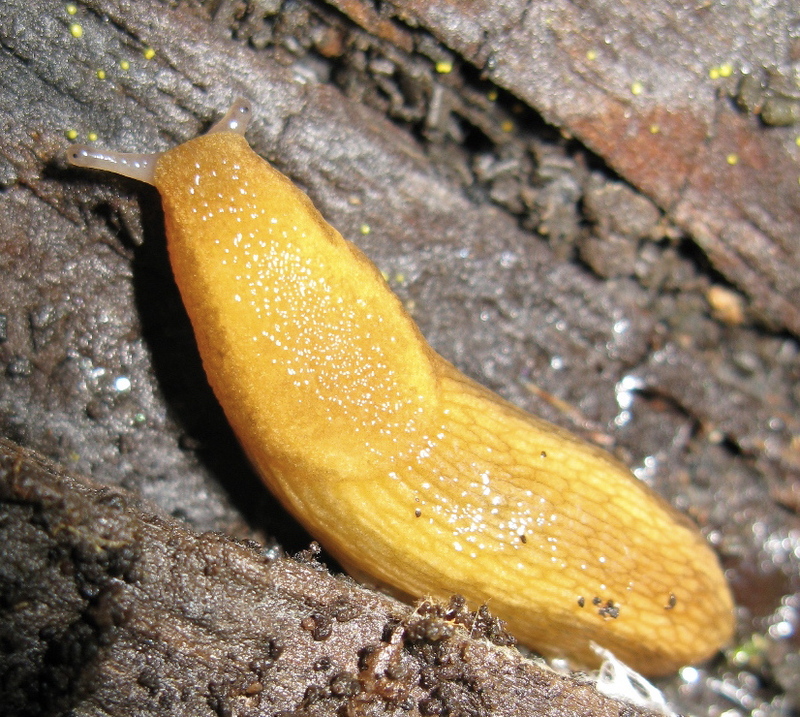 In North America, species range in size from barely two inches long to nearly three feet long. 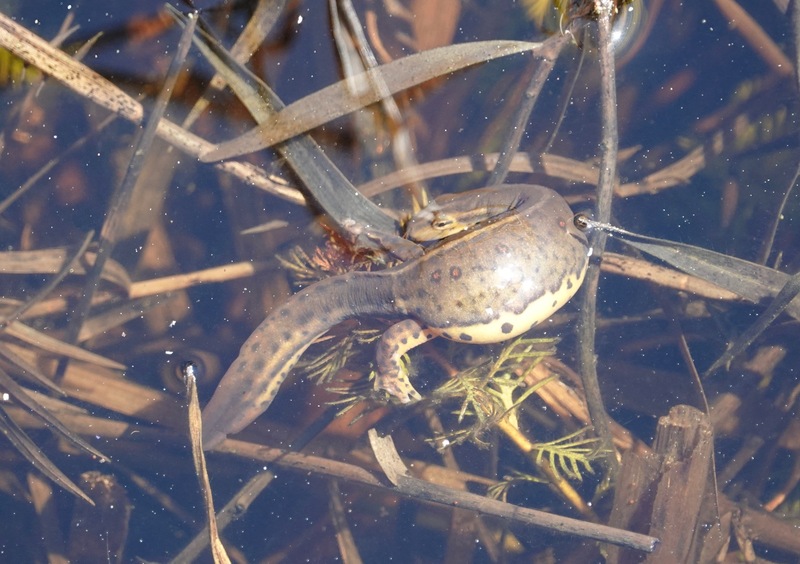 Some, like the big hellbenders, are fully aquatic, others mostly subterranean – the Spotted Salamander can live up to a dozen years, but will spend less than six months of that above ground, emerging to migrate to vernal pools and wetlands to reproduce – but all depend on moisture; the terrestrial species usually only emerge from cover at night or after rains. The Red-backed is a member of the family Plethodontidae, which is exclusively New World and includes about 230 of the 380-odd known species of salamanders on the planet. Plethodontidae are lungless and breath through their skin, hence their imperative to stay moist. 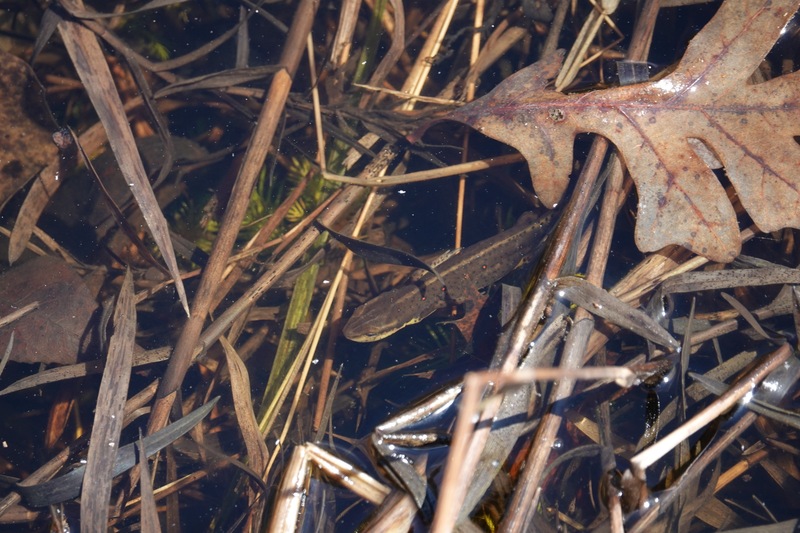 The presence of this animal is a good sign of the health of this particular patch of wetland/woodlands. 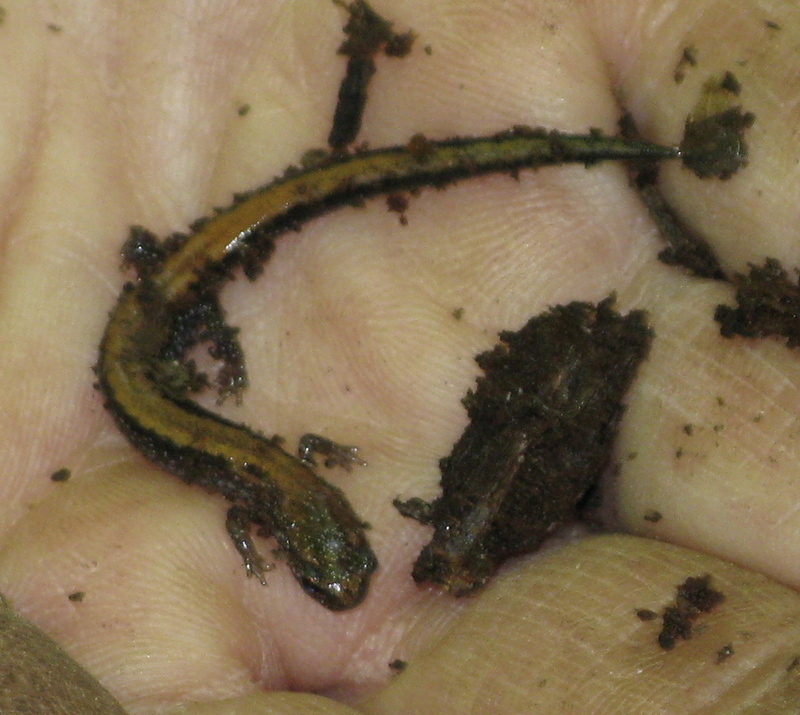 Unlike lizards, salamanders have moist smooth or warty skin, not scales, and lack claws. Like lizards, their tails can snap off and then a new tail regenerate, but never quite as well as the original, so if handled they must be handled carefully, without grabbing the tail. Another distinction between lizard and salamander is that it’s very hard to catch a lizard, but not so hard to catch a salamander. And it’s easy to kill them. They must run gauntlets of cars on roads through their territory; they must survive silted, dammed, and polluted water bodies, drained and “developed” habitats; acid rain and other toxins; and etc. (the damned et ceteras we make!). They are not nearly as abundant as they once were. The great hellbenders, gloriously unusual creatures, in particular have been hard hit and are endangered in several states. Salamanders have long been associated with fire, probably because they often shelter under bark, and when that bark was lit aflame, they fled, thus looking like they were “created” by fire. Cf. Aristotle and Pliny. 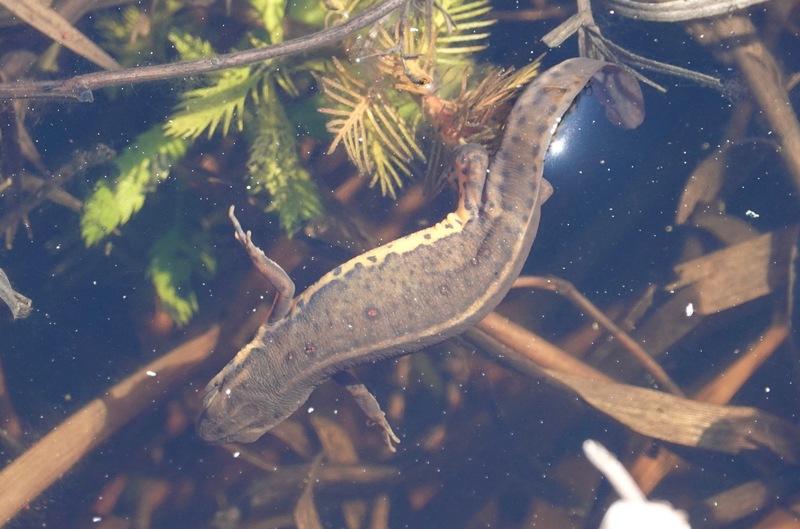 Besides being actual animals, salamanders have become legendary, particularly in alchemy, with its obsession with transformation and transmutation. The word itself is ultimately derived from the Greek via the Latin, but may stem from sources further east. “Salamander” has also over time meant a fire-eater, a woman who lives chastely amid the fires of temptation, and a soldier who exposes himself to battle-fire. Today, it’s also a restaurant kitchen broiler. When this particular Red-backed salamander curled into a ring in the palm of my hand, I thought of Ouroboros, the mythic serpent or dragon that swallows its own tail, a symbol of eternity and infinity, a symbol of the cycles of the natural world.